You wanna talk ‘under appreciated artists’, how about all the thankless hours parental figures the globe over spend icing up birthday cakes in the style of their kids chosen sport or favourite fictional character? Yeah like that Spider-Man cake you had all those years ago. 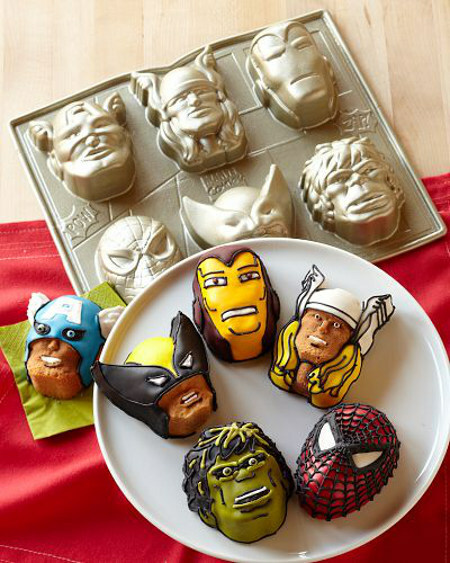 Well now the fine folks at Williams-Sonoma let you finally return the favour in style, with a mini-cake mould that let’s you create eatable versions of your favourite Marvel Heroes to share with your folks and pull off the ultimate full-circle moment. While the pick of who Marvel Marketing deem as your favourite characters may leave a sour taste in your mouth, without uncanny icing superpowers whose to say if the Captain America, Hulk, Iron Man, Thor, Wolverine and Spider-Man mugshots won’t end up looking like The Silver Surfer, She Hulk, Ghost Rider, Daredevil, Thing or Nightcrawler anyway? Me – I’d just become a Hulk cake making factory. For some reason 'Hulk' and 'cake' click together a bit to well. For Williams-Sonoma's full Marvel range, including Spidey comic cover cookies, click the jump. Now those look really good, especially the Hulk and Thor one. Sign me up because they all look delicious!